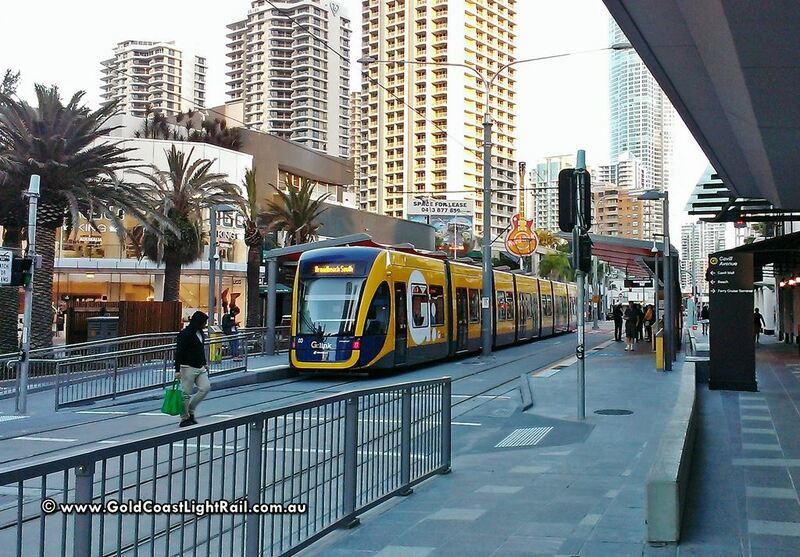 The state of Queensland, in partnership with the City of Gold Coast (CoGC), is preparing a detailed business case for Gold Coast Light Rail Stage 3A (Broadbeach South light rail station and Burleigh Heads). The preferred alignment for the proposed Stage 3A extension runs down the centre of the Gold Coast Highway for 6.7 kilometres with planning for up to eight stations. Station locations are indicative and have not been finalised. – A journey time of about 16 to 17 minutes. Should the project progress to construction, it would take about two to three years to build Stage 3A. The detailed business case and reference design development will be complete by the end of 2018 for government consideration. Celebrate the launch of Stage 2 at the opening celebrations this Sunday 17 December 2017 from 9am. From 5am ride the tram for free to the celebration events at Helensvale, Parkwood and Parkwood East stations. Free sample bags will be available for passengers at all Stage 2 stations from 6.30am while stocks last. Strap yourselves in as this is going to be brutally honest. CAVILL AVENUE STATION SHOULD BE RENAMED “SURFERS PARADISE”. Tourists visit our beautiful Gold Coast and desire to visit Surfers Paradise. They are alighting at the (current) Surfers Paradise station, walking around thinking there’s not much here. (Q1 building and the immediate surrounding area). They then get back on the tram disappointed and having spent little money in the precinct, and return to their hotel. This is where the naming of the stations hits a massive hurdle for tourists and visitors, shop owners in the heart of Surfers Paradise, and the local economy in general. All are seriously missing out on that much desired experience. Cavill Avenue station needs to be renamed Surfers Paradise, to prevent such further confusion in the future. As it currently stands, further loss will occur to many who visit Surfers Paradise, and those who have livelihoods and businesses in the Surfers Paradise area due to this poorly conceived naming during the light rails conception. The current Surfers Paradise station (at Q1) needs to be renamed Surfers Paradise South, to bring it in line with the current naming conventions. My guess it will never happen because the people responsibly for the naming originally will not want to concede they have got it devastatingly wrong. Until then Surfers Paradise will miss out on many visitors and their economic boost. The stories that are regularly discussed to Gold Coast Airport staff about the Gold Coast Light Rail station naming confusion will continue. From the OFFICIAL youtube channel of the Council of City of Gold Coast. Comes the latest fly-over video of ongoing construction for Stage 2 of the Gold Coast Light Rail. Much of the rail is laid with Helensvale, Parkwood, Parkwood East, stations are all taking shape.